Made in Australia - Some parts & fittings sourced from international suppliers. Our Filters and many other parts are made here in Australia in our own workshop. Some fittings and parts are sourced overseas. For a smoother, sweet running engine fit a Jackmaster Bypass Oil filter. Your engine performance will gradually improve as the filter removes varnish and sludge etc., and cleans up all moving parts. Besides having clean oil, buyers are reporting a significant increase in fuel economy. Modern diesels create more soot - the solution is a Bypass Filter. Full standard kit plus or filter canister assembly - express registered post available within Australia. International postage is easily arranged. 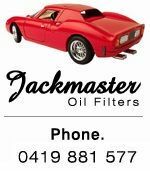 With a bypass filter you only change your full flow filter occasionally as it is now filtering clean oil; that and the oil you save can pay for it in a very short time while you get sweet running and long engine life with fewer repairs. You may be surprised who uses recycled oil. It is so widely used, perhaps you should get in on it too - and the best place to recycle it is in the engine - where it counts. Paste the following link into your browser and read this very good piece on how the EPA has made rules which make your engine run very dirty. The only way to solve this problem is to use bypass filtration. It is used on many diesels but you need a larger dedicated filter. Dimensions : 112mm Diameter x 160mm high. Designed to fit virtually any vehicle. We can provide quality hose and fittings which will make it a simple job for you to install. Just copy this email address and paste it into your Email account to send. It cannot be sent from within my website. Please ring or email me to discuss the kit variations you require. We have many letters of recommendation from customers who were more than impressed with results. We don't keep them all as there are so many, but just ask and we can send you a couple. You will be very impressed yourself when you try this genuine item. This is one of those things that really works. I haven't changed my oil for years, what more can I say. One of the best indications for the value of this filter is the very rare event when one of our filter kits is re-sold as a used item - it sells quickly and for a very good price.